The new Grand Soleil 34 'Justtina' that is cutting a dash as it debuts on Irish waters at the DBSC Turkey Shoot marks a return to sailing for her skipper John Treanor who forged a love for yacht racing on his first Dun Laoghaire to Holyhead ISORA race over 30 years ago. "I set out to buy a boat that could be cruised by just myself and my wife (Tina). Hence the easy single handed set up", Treanor told Afloat.ie, "But at the same time, having raced in my youth, I wanted to buy something that could cruise fast and had the potential to race well if I chose to do so". 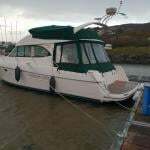 Treanor says he set out to buy a J112E but when he went to look at the boat at Key Yachting in the UK he also saw the GS 34 which had just arrived and he says "it seemed to better match my requirements than the J". Below he relates the story of how the boat was purchased and his plans for her. 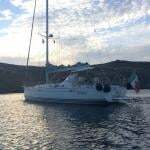 "Myself and Tina subsequently saw the two boats side by side at the Southhampton Boat Show and I got the clear instruction “You are buying the Grand Soleil”. A few weeks later, I sailed the tiller version on a blustery day in Southhampton. The tiller just didn’t work for me as the helming angle was wrong and the tiller tended to kick aggressively upwards in the gusts. In addition, the tiller intrudes into the open layout of the cockpit and reduces the free movement of the crew. However, I am sure that an out and out racing owner would probably opt for the tiller version. Ultimately I opted for the twin wheel version. Regarding performance, the boat is currently been sailed with a very limited sail wardrobe and the rig has not yet been set up properly. In addition, to say that it is not been helmed very well (my fault) would be an understatement! Despite all that, she performs well on the water and on the odd occasion when I do my job right she can point as high and sail faster than the 109s. Which is better than I expected. Downwind she can’t sail as deep as the 109s but with a proper kite would probably sail faster than them. Regarding my plans for next season, I am not based full time in Ireland so that somewhat limits my ability to take part in long series racing. So, for now, I plan to do the ICRAs followed by D2D then back to Cork for Sovereigns Week and back for the Dun Laoghaire Regatta. And then a few weeks based in Crookhaven in August. Shanahan's J109 Ruth is Overall Turkey Shoot Winner But Vespucci Takes the Prizes!